Check out all the detail in the petals, ribbons, and scroll work; I'm pretty sure that's what perfection looks like. She has a lot of fun, modern designs. It's titled simply "Ninja Bride." Is that really "No more monkeys jumping on that bed?!?!" I could have used that to celebrate my daughter getting the cast off her foot after she broke it . . . you guessed it . . . jumping on (rather, off) the bed! The butterfly cake is priceless as well. I LOVE Sunday Sweets! 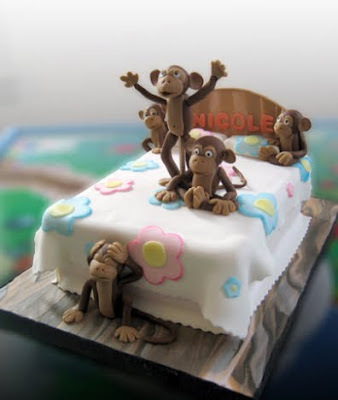 My 4 year old especially loves the 5 Little Monkeys Jumping on the Bed cake. He keeps coming over to the computer to sing the song! Hope you and hubby get rest and feel better soon! The Ninja Bride herself is wonderful but that little added detail of the cherry blossoms is what sent me into a full swoon. Want!! zoowie! 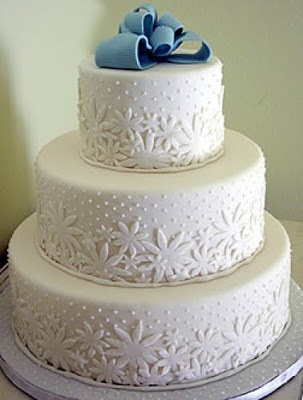 great cakes, and I want to try that beautiful bow (won't even try the rest of the lovelies!) the guitar is mind blowing! Aww! You're sick and you still posted Sunday Sweets for us! Thank you! 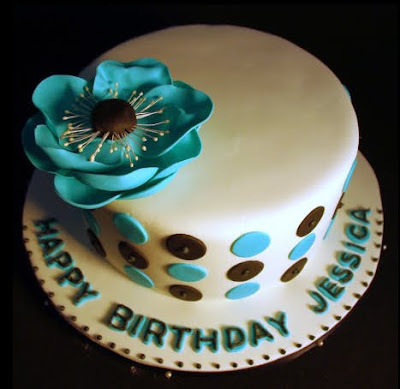 My daughter, Jessica, thanks you for the birthday cake today too! I wonder if Ninja Bride is a fan of Ninjatown. *gasp* I love the red butterflies!!!!! I think that is my absolute fave. A close second has to be the ninja bride. If I had had more time planning my wedding, and saving more money, and if I had known such a cake existed, I would have gotten the ninja cake. My husband would have loved it too. That or a Katamari cake, but I have yet to see one of those. Sunday Sweets is the best. I wait with great anticipation to see the cakes every sunday, then I get a second dose from Cake Boss monday nights. I'll never be as good. :( But I try. Wow, what great cakes! The wrecks are my favorite though. Those are so beautiful! And the monkey cake is very nice. I love the monkey cake!! My nephew (who is 5) would get such a kick out of having a cake like that. The ninja bride cake looks like a feminine version of the crochet ninja in a book called "Creepy Cute Crochet" by Christen Haden (www.needlenoodles.com). I know, because I just crocheted one last week. LOL! Aw, I love the ninja bride! Hey John - two drums and a cymbal fell off a cliff. Ba-dum tish! Two peanuts were walking in a dark ally way. One was a salted. Ohwa, Tagoo, Siam. Hope it helps! Such pretty cakes - I love the monkeys jumping onthe bed! 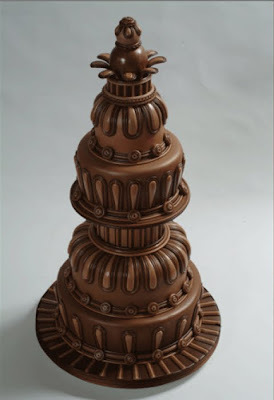 Love the chocolate chess piece! 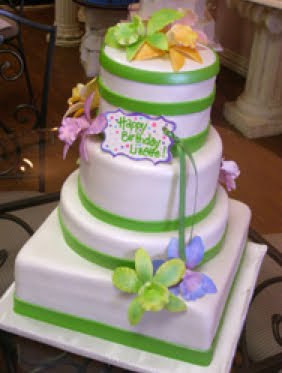 Wow - Love the Wicked Cakes, and then when I went to the site it is someone I knew years ago. I think the 5 little monkeys is the cutest thing ever! Bronwen is awesome! I love watching her on the Food TV Challenges and I always root for her. I bet it was a real treat to have her make a cake for your tour. 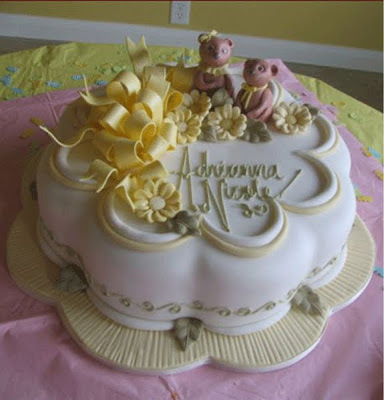 I LOVE the monkeys cake...adorable! And the ninja bride is totally clever...I can see how that would pep up your average wedding. not only do i love ALL of these, i want that cake stand in the first photo! i'm no baker, but these awesome cakes make me want to get into a kitchen and whip some up! Jeanie, YOU READ MY MIND! The first thing I thought when I laid eyes on that lil ninja bride was "NINJA TOWN!" I hope you share a picture of Bronwen's cake for your Frisco stop. I love watching her compete on Food Network especially being from Dallas. Wow! These are the best I've seen in a long time! Very impressed. I heart that white butterfly cake!!! Love the monkeys jumping on the bed! 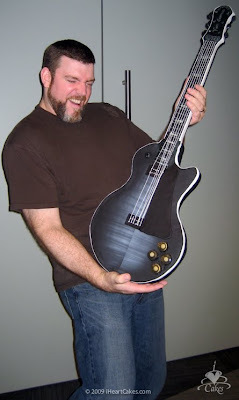 The guitar cake is awesome. And the guy holding it can have my phone number. Those are all just beauties ! I LOVE Sunday Sweets ! 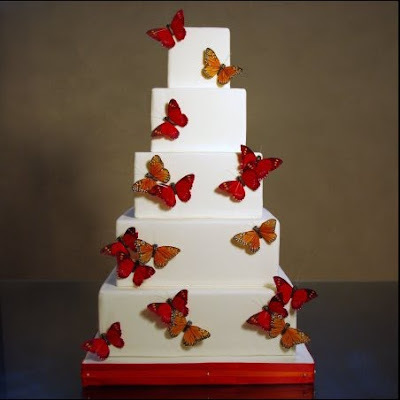 That butterfly cake looks like a bunch of them just were floating by...and happened to land on the cake. Stunning. I love love love the yellow/brown/blue cake. Don't know why I just love love love it. And listen you two, stop being sick RIGHT NOW! Holy crows! 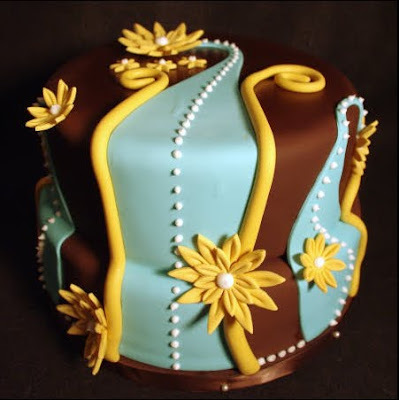 You need a companion blog for the most awesome cakes ever!! These are unbelievable! 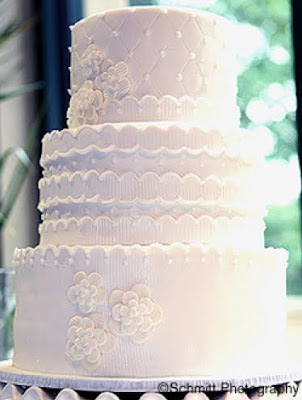 I love to bake but I have never gained the courage to try to make such beautiful cakes! After drooling over them (especially the chocolate one) I'm going to attempt it, they probably will not look like these, but even if it goes horribly wrong it can provide some comic relief from school work. Hilarious! 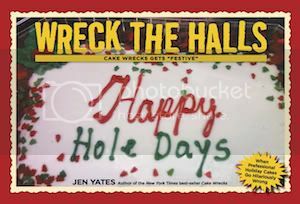 My friend just emailed me to tell me my cake was famous, for a minute I was afraid (I am familiar with the site). Coco Paloma did my wedding cake, the one right above the ninja bride (super cute!). I love her sense of style. The ninja bride is amazing. 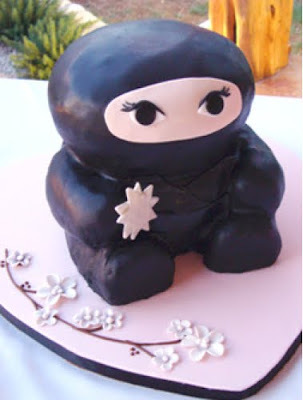 Love the Ninja Bride cake. I swear it must be inspired by the Google Reader Ninja. These are all so nicely done. And they make me wish that I were a cake decorator. I LOVE the monkey one. Makes me wish I had a kid. 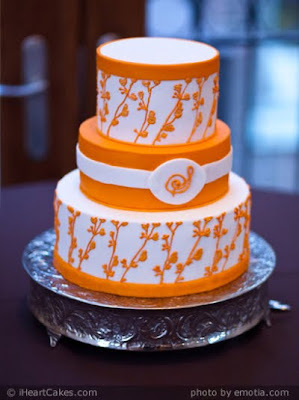 Was that supposed to be a treble clef on the orange cake? If it was, I would call that a music fail.